Muddy marvel Reve De Sivola ground down his rivals in testing conditions as he led from start to finish to win the Long Walk Hurdle at Ascot. Trained by Nick Williams and ridden by Richard Johnson, the eight-year-old's stamina came to the fore in the exacting conditions at the Berkshire circuit as he gamely held off Salubrious by 10 lengths. At Fishers Cross, the 8-11 favourite, looked well beaten when he ditched jockey Tony McCoy at the final flight with a jump reminiscent of the bad one he made last time out at Newbury. Connections of Salubrious might feel a little hard done by as the six-year-old made a costly gaffe two out when seemingly still full of running. Johnson said: "He's a very honest horse - he's a very good horse. 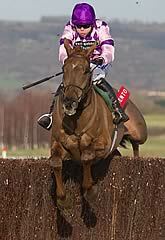 He's a very, very good hurdler and we know soft ground suits him very well." Reve De Sivola is unlikely to run in the Cleeve Hurdle at Cheltenham in January, which he won last year, but remains in contention for the Ladbrokes World Hurdle at the Festival in March. Williams said: "He crashed through a couple of them, but on softer ground like this, he can really let himself down. "I don't think we'll go for the Cleeve Hurdle again, but we will go for the World Hurdle. Perhaps if we can also find him an easier race in February, that might be the way to go." Trainer Paul Nicholls said of Salubrious: "The jockey (Daryl Jacob) thought if he hadn't missed the second-last, he would have won. But it's still a decent effort and we know we've got plenty of staying options for him." 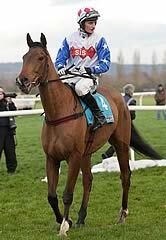 Time For Rupert returned a bad scope following his disappointing comeback run in the Long Walk Hurdle. Having nursed his stable star back to full health after the removal of a growth close to his brain, trainer Paul Webber was initially disappointed with how quickly the nine-year-old faded to finish a well-beaten last of four finishers. It appears there was a viable excuse, however, and Time For Rupert is set to return to chasing on his next start. Webber said: "Rupert is absolutely fine. We were disappointed as all the pre-race tests we did came up clear, but we scoped him after the race and there was some mucus there. "He has obviously picked something up at the last minute, which can happen from time to time. "It happened with Long Run earlier in the season and it's something us trainers have to battle with. I think it explains why he stopped a bit sooner than he should have done. He was fitter than that. "Hopefully, you'll see a better performance in either the Argento Chase at Cheltenham (January 25) or the three-mile chase at Doncaster on the same day (Sky Bet Chase). "After that, we'll see if we can persuade the owners to have a look at the Grand National."